This diving safari covers the coastal section of the southern Red Sea offering stunning diving on a huge variety of reefs, walls as well as hard coral gardens teeming with fish life. MY Excellence is a very spacious luxury liveaboard, designed especially for divers needs and has gained therefore the love of many divers. 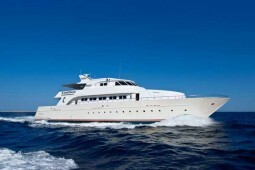 She is just a favourite liveaboard all over the Red Sea.